Peptide with sequence C-YEEDGSRAIHRKT, from the C Terminus of the protein sequence according to NP_005726.1. This epitope was selected to minimise the chance of cross-reactivity with ACTR1A (YEEDGARSIHRKT). Small volumes of anti-ACTR1B antibody vial(s) may occasionally become entrapped in the seal of the product vial during shipment and storage. If necessary, briefly centrifuge the vial on a tabletop centrifuge to dislodge any liquid in the container`s cap. Certain products may require to ship with dry ice and additional dry ice fee may apply. Peptide ELISA: Antibody detection limit dilution 1: 128000. 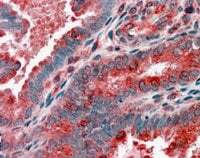 Immunohistochemistry: In paraffin embedded Human Uterus shows fibrillar staining of cytoplasm in endometrial cells. Recommended concentration, 3-5ug/ml. Western Blot: Approx 45kDa band observed in human heart and brain lysates (predicted MW of 43kDa according to NP_005726). Recommended for use at 0.5-2ug/ml. Staining (1ug/ml) of human heart lysate (RIPA buffer, 35ug total protein per lane). Primary incubated for 1 hour. Detected by western blot using chemiluminescence. (3.8ug/ml) staining of paraffin embedded Human Uterus. Steamed antigen retrieval with citrate buffer pH 6, AP-staining. NCBI/Uniprot data below describe general gene information for ACTR1B. It may not necessarily be applicable to this product. ACTR1B: Component of a multi-subunit complex involved in microtubule based vesicle motility. It is associated with the centrosome. Belongs to the actin family. ARP1 subfamily. 1. Data show that 4-oxo-4-HPR inhibited tubulin polymerization and modulated gene expression of spindle aberration associated genes Kif 1C, Kif 2A, Eg5, Tara, tankyrase-1, centractin, and TOGp.